TS PGECET Answer key 2018: Telangana PGECET Preliminary answer key available at pgecet.tsche.ac.in. All the candidates can get their TS PGECET 2018 key with question papers and responsive sheets. TS PGECET 2018 entrance exam has conducted by JNTUH, on behalf of TSCHE during 28.05.2018 to 31.05.2018 in two sessions. 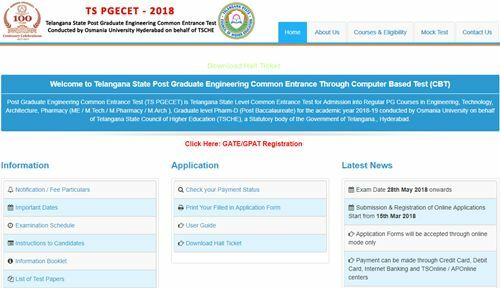 Post Graduate Engineering Common Entrance Test (TS PGECET) is Telangana State Level Common Entrance Test for Admission into Regular PG Courses in Engineering, Technology, Architecture, Pharmacy (ME / M.Tech./ M.Pharmacy / M.Arch ), Graduate level Pharm-D (Post Baccalaureate) for the academic year 2018-19 conducted by Osmania University on behalf of Telangana State Council of Higher Education (TSCHE), a Statutory body of the Government of Telangana., Hyderabad. TS PGECET 2018 Preliminary Answer key had been declared in many related websites. The Telangana PGECET board will be conducting exam for M.tech courses and it will finish this exam recruitment at the end July month. The Student should posses at least qualifying marks in ts pgecet answer key 2018. The same pattern is been followed this year. Here we are provided with Answer keys for all the branches available here. So, the Students who are about to download TS PGECET official Answer keys had been provided in Official website. Result will be Published soon.